There are certain things you only learn through direct experience. Roughly four years ago, I had the chance to go through an experience which entirely changed the way I look at problems. At that time, I was in the process of graduating from my design studies in Helsinki and was planning to organise a do-it-yourself (DIY) workshop to collectively build a public outdoor oven. I was looking for help from professional brick-layers, but none seemed to be willing to teach their skills to a bunch of beginners. Just before, a friend had introduced me to the online platform The Public School, a ‘school without curriculum’, where anyone can propose classes on anything to try and find like-minded people and potential teachers.2 I gave it a try and posted my request. Quite soon, I received an answer by a lady named Salla Kuuluvainen, a food activist and active urban gardener. She had once participated in a cob oven building workshop and suggested that technique instead of using bricks for the oven construction. Cob is a rather simple, cheap and ecological way of building.3 The thread between the two of us continued until we agreed on a meeting in a small café in Helsinki. Salla brought a friend along, Tanja Korvenmaa, who had experience in mediation and facilitation and, also in building with cob. 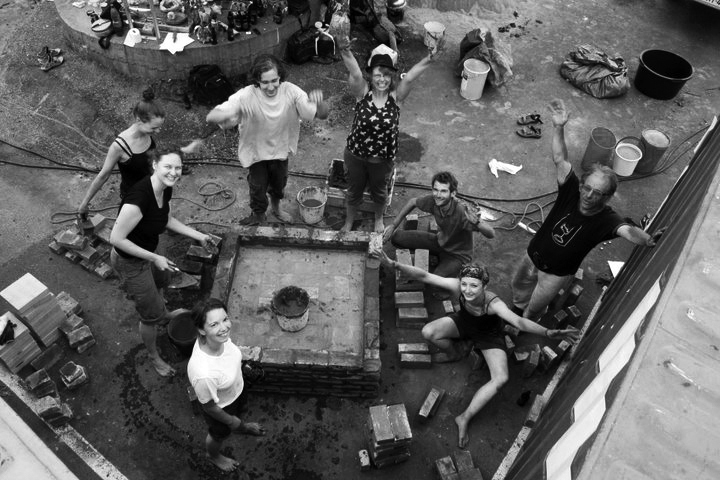 A month later, the workshop was scheduled and a group of about fifteen people from various professional backgrounds, ages and nationalities gathered around the planning and making of a cob oven in an urban location. With the help of an open-source online manual (passionately provided by Simon Brookes on his blog The Clay Oven4), the oven was built during a sunny weekend in the late summer at the former fish harbour Kalasatama in Helsinki. 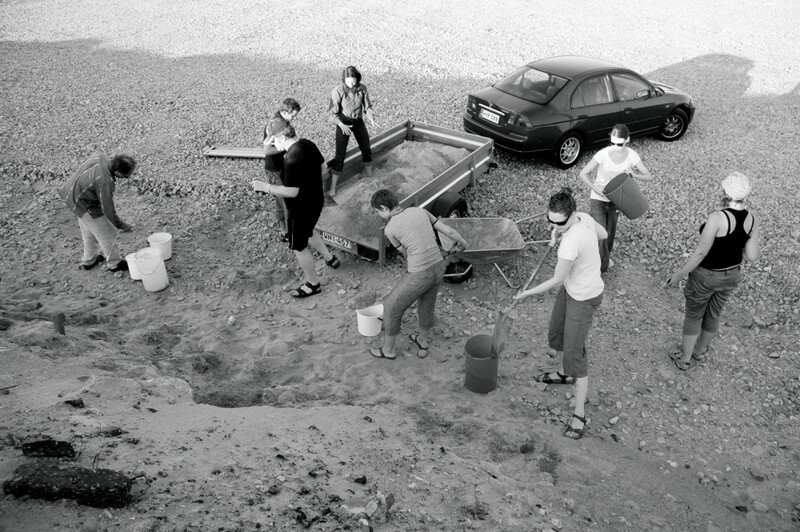 Kalasatama was a vacant construction site at that time and, so, open for cultural activities and projects.5 We used only found materials from the direct environment such as clay from the riverbed of a nearby forest, old bricks and sand from a construction site, and water from the Baltic Sea. Only the baking surface needed to be safe for food, so we crowd funded the purchase of a few special bricks from the hardware store amongst the building group. After the weekend, the oven was built and almost ready for use; it just needed a last layer of clay and a few days drying until we could fire it for the first time. And it worked! Its first official use was during the harvest festival of the local environmental organisation Dodo,6 when it produced many delicious pizzas topped with vegetables from the nearby urban gardens. Amongst many other events, another highlight was our participation in Restaurant Day,7 where we organized a DIY pizza afternoon with wild ingredients foraged from the local woods. With more than 100 pizzas baked, an estimated 200 people participating, and everything eaten up, the event proved a big success. The empowering dimension of learning from each other how to build something rather technical by simply doing it swept all of us off our feet. It did not only generate pride in each one of us, but also created social bonds amongst the group that have continued over the years until today, even after the oven had succumbed to the Finnish climate after two years of heavy use. To make the oven publicly accessible, we set up a blog called Stadin Uuni8 (meaning ‘The City’s Oven’), where people could make reservations through an online calendar and check instructions on how to use the oven. It quickly became known across the city and was used by many different groups and individuals. It also inspired several other ovens in the city, such as the oven at Dodo’s urban garden in the Pasila district9 and the one in front of the new food court Teurastamo near Kalasatama.10 Different and new members of the building group took care of answering emails, doing small repairs to the oven, upgrades, and refilling firewood. Mutual education seems a very potent tool for social change. It enables people to understand and, beyond that, participate actively in changing the conditions of our lives. This liberating process is founded in the theories of Paolo Freire who I mentioned above. His learning theory is known as critical or radical pedagogy, which combines education with critical theory – a school of thought that puts forward the reflection and critique of society and culture. Freire emphasises the students’ ability to think critically about their social and historical context to understand how it was connected to their individual problems. He coins this ability as ‘critical consciousness’, the ability to ‘read the world’ in order to become active subjects in the creation of a democratic society.23 Critical consciousness is a crucial ingredient that supports self-determination and self-directed learning — how are we to know what we need and want to know in order to understand the world if we are used to prescribed curricula by the state? The recent documentary alphabet by Austrian filmmaker Erwin Wagenhofer27 in 2013 leaves the impression that not much has changed since then, depicting an educational system that kills creativity and trains our children to become part of a competitive production force. He emphasizes the importance of playful failure to be able to look for new solutions. Wagenhofer does not blame the system, but every individual, saying that it is up to us to position ourselves on how we want to live, but that we need to live differently.28 The documentary Lottery of Birth from the same year by filmmakers Raoul Martinez and Joshua van Praag29 explores the forces that determine who we become and in what structures we think, which also determines the society we create. The awareness about the forces which come from our families, schools, culture and professional work can be a starting point to rethink the way we live. It requires learning new skills and ways of thinking which lay at the heart of the current world-wide movements of sharing knowledge, collaborating, and very simple and practical making. The 2013 German book Stadt der Commonisten (‘City of Commoners’) by the three sociologists Andrea Baier, Christa Müller and Karin Werner30 beautifully compiles and portrays the many different and colourful forms this new sense of ‘commonism’ may take, from Repair Cafés31 over urban gardens to open-source cargo bike collectives to maker labs.32 What they all have in common is the open trial-and-error-attitude Wagenhofer thought was lacking in our schools and an endless curiosity to explore unknown fields without having a problem with being amateurs. Maybe, it is the human scale that is missing in our globalised world, the very essence of what makes us human — to do things with our hands, to know how things are made and what from. Sociologist Richard Sennett’s book The Craftsman35 describes how making things with our hands is crucial for us human beings to ‘enrich our lives’ and ‘be in touch with the world around us’. His later book Together36 depicts how cooperation is something embedded in human nature and highly relevant for societies to flourish. The learning initiatives popping up all around the world go beyond online manuals and open access to knowledge – they create community by physically bringing people with similar interests together, creating new possibilities of mutual learning experiences. DIY has become do-it-with-others (DIWO) or do-it-together (DIT).37 People from all ages, backgrounds and nationalities meet up to share their knowledge with others – not motivated by money or competition, but by the rich exchange of knowledge, the new insights and experiences, and, last but not at all least, the social networks and community arising around it. Taking up different roles at the same time, the one of a teacher, of a learner, of an ‘experimenteur’ and collective researcher is the foundation of mutual learning. Those roles are fluent and exchangeable, putting all on the same eye-level. It is empowering to realise that everybody has something to share, to be part of the whole that is greater than the sum of its parts,38 no matter how small one’s contribution. As Mezirow describes, such learning experiences can be transformative, or as Mokka said, almost spiritual moments. This was certainly my experience during the cob oven building, for me and my fellow builders. 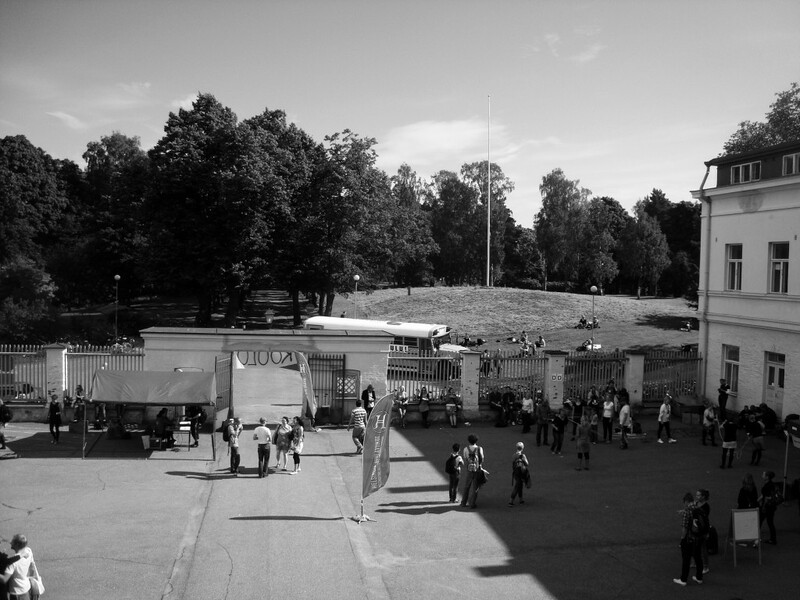 In 2012, the independent think tank Demos organized ‘Koulu’, an experimental open school festival in Helsinki.39 People were invited to teach their skills in short sessions during the festival. No limits were set in advance about the teaching content, so there were classes ranging from life drawing to ukulele-playing and programming. What is particularly interesting is that people were enthusiastic to sign up to become a teacher even though they did not have any previous teaching experience. The open invitation to teach your skill had an empowering dimension simply by expressing the idea that everyone can teach their passion. I got involved with Trade School (TS) Berlin by a lucky coincidence: I learned about its existence through Amber Hickey’s book Guidebook of Alternative Nows42 and then met Vanessa Buth while participating in the bike ride book launch of the Community Lovers’ Guide to the Universe,43 organized by European Alternatives as a part of the Transeuropa Festival.44 Vanessa had been part of the TS Norwich and was eager to get involved with the Berlin chapter having recently moved to Berlin. We got in touch with the founders of TS Berlin, two young women from New York – Harley Aussoleil and Jes Walsh, who are also part of Boys Club, an open project space that combines living and working, it being their own living room with a large front store window. Harley and Jes were happy to get support from other organisers, and after a few meetings of planning and discussing, we set up an open event to reintroduce TS to the neighbourhood. We also invited other similar initiatives from Berlin, such as the Tauschring Neukölln45 (a barter community) and the Bürgeruni46 (Citizen University), which is inspired by another learning experience, The U,47 from England. Other TS chapters from Milan and Halle also joined to present their activities and stories, which all differ depending on the people involved and local circumstances at hand. We kicked-off the season with a first class on internet security, which was followed by three intense months of diverse lessons ranging from dance, philosophy (e.g. How to change your life forever), open design, cooking (e.g. Chinese Dumplings, Italian Pizza, Finnish Cuisine), bike repair, help with German bureaucracy, and many other, mostly very practical classes. 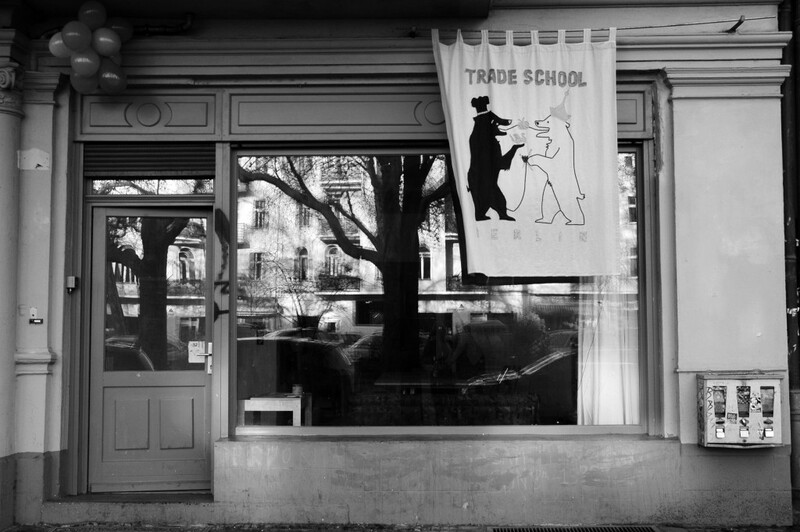 Trade School and all of the other initiatives described above demonstrate that value is subjective and diverse. These initiatives encourage cooperation by people wanting to give back something to someone that goes beyond the usual value of money. They establish and explore a new kind of solidarity economy that emphasises the fact that everybody has something to give. They create an alternative system of mutual exchange, redefining and expanding the term capital to the social, hopefully shaking off the negative sound it still carries along to establish a new and healthy alternative economy based on mutual respect and collective interests. Beyond that, they create new local communities and knowledge specific to a place which can be shared globally via the internet. And finally, they redefine the term ‘amateur’ and make it something positive again: people engaging in an activity for the love of it, with an open mind unrestricted by formal training and financial pressure. So, here’s my honest recommendation as a DIY/DIWO/DIT enthusiast: If you ever get the chance to create or make a learning experience with any of the initiatives described in this book, grab it. Get involved. Share your knowledge. Create a local community. Or simply start your own initiative. You will love it. 3 ‘Cob’ is a mixture of clay soil with straw, stone and other materials which strengthen the matrix on drying. It is a well known construction technique for vernacular buildings worldwide. 11 Illich, I., 1971. Deschooling Society. New York: Harper & Row. 14 Köppä, T., 2009, Remarks on rural co-operation in Finland. Keynote presentation at the Alternative Economy Cultures seminar, Pixelache Helsinki Festival. Helsinki: Kiasma Museum of Contemporary Art on 03 April 2009. 15 Kropotkin, P., 2008 (1902). Mutual aid: A factor of evolution. Charleston, SC: Forgotten Books. 16 Googling this term, there does not seem to be a consistent definition, being used in many different, not necessarily suitable contexts, so it still seems to be a term in emergence. 18 Clark, M., C., 1991. The restructuring of meaning: an analysis of the impact of context on transformational learning. Thesis EdD. University of Georgia, 1991. 19 Mezirow, J., 1997. Transformative Learning: Theory to Practice. New Directions for Adult and Continuing Education, 74, pp.5–12. 20 Mezirow, J.,1995. Transformation Theory of Adult Learning. In: Welton, M.R. ed. 1995. In Defense of the Lifeworld, New York: SUNY Press. pp. 39–70. 21 Torosyan, R., 2007. Teaching for Transformation: Integrative Learning, Consciousness Development and Critical Reflection. Unpublished manuscript. 23 Freire, P., 1973. Education for critical consciousness. New York: Seabury Press. 24 Trapese Collective ed., 2007. Do It Yourself: A Handbook for Changing Our World. London: Pluto Press. 27 alphabet. 2012. [Documentary] Directed by Erwin Wagenhofer. Austria: Prisma Film. 29 Lottery of Birth. 2012. [Documentary] Directed by Joshua Van Praag and Raoul Martinez. UK/USA: Independent Production. 30 Baier, A., Müller, C. and Werner, K., 2013. Stadt der Commonisten. Bielefeld: transcript Verlag.